Purchasing Ticket: Contact us by E-mail( ticket@yuki-eiga.com ) by the end of October. When your registration is completed and ticket fee is remitted, a ticket will be sent to the address you registered. Registration will start from 1st of September. 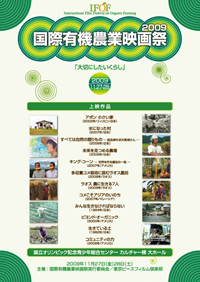 Special Talk on "What is on Asian Villages now"
There are 3 films depicting Asian farmers' fight against globalization. Two among them were from Laos by chance. Visiting students of Organic Agriculture at Asian Rural Institute (ARI) situated at Nasu-Shiobara shi, Tochigi, Mr.Houmphan from Laos and Ms.Polkhayan from Thai will talk on the backgrounds and situations in Laos and Northeast Thai. New farmers talk:"the life I value most"
With a special reference to the film "A Farm with Future Vision", we will have 3 new organic farmers to talk about their view on life they value most. There will be a casual talk after their presentation. 3 min. video show: "My view of food and farming"
This gives chance to go one step forward from "just watch" to "make and show"for you. It is our wish that more people will take part in IFOF thru making videos and films for 3min. video show. Your entry of 3 min. video on food and farming is most welcome.